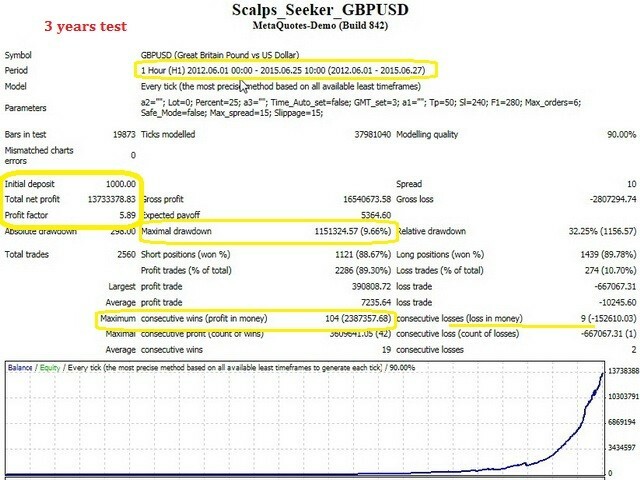 This is a system designed for scalping GBPUSD. Like any scalping system, transactions are carried out quickly, this requires broker with fast execution. Profits are 30-70 pips / 5 digits /, so that the broker must have low spreads. To find a suitable broker, you can use my other product “Low Spreads Seeker” – https://www.mql5.com/en/market/product/7893 . Does not use Martingale. Money Management: the EA automatically carries out reinvestment, increasing the lot in accordance with the growth of a deposit. Lot - If you want a fixed lot of each deal set it here. Percent Risk - If you set Lot = 0 - any deal will have a volume which is calculated as a percentage of free margin set by the “Percent Risk”. Time Auto setting - If is "true" the robot automatically adjusts to GMT(UTC) time. Attention !!! If you use a tester, “Time Auto setting” must necessarily be “false”. GMT(UTC) Setting - If "Time Auto setting" is "false" put the difference between the time of your terminal and GMT(UTC). Take Profit – select its value after testing in the tester or a demo account. Stop Loss – select its value after testing in the tester or a demo account. Dinamic Filter - filter that limits losses. Maximum open Positions – the maximum permitted number of simultaneously open trades. Safe Mode - mode of closing deals under certain conditions. Reduces drawdown. Maximum Spread – limiter the spread. If spread is over the specified, deals are not performed. • Using the information panel – (true/false) - switch the information panel on/off. • Double-click and drag-and-drop can be used to move the panel to anywhere on the chart. Added a new option - Asia stop hour. It is the hour in which the new function closes all open orders during the Asian session. If you want to disable it, enter into Asia stop hour number greater than 50.